Mordian 7th Regiment: 40k Genestealer Cult - Goliath Rockgrinders nearly complete, and some Heresy! 40k Genestealer Cult - Goliath Rockgrinders nearly complete, and some Heresy! Got some brush time in today and have the Rockgrinders more or less up to the "Fresh off the factory floor" stage, where I'll generally give the models an initial sealant pass in preparation for waterslide transfers and weathering. I did up the tarpaulins on the rear in a blue to match the chitin of the 'stealers, rather happy with how it turned out, and it is a sufficiently different color from the lamps and power cables. Next up is finding some good industrial-style transfers and give 'em some sponge weathering and they'll be good to go! 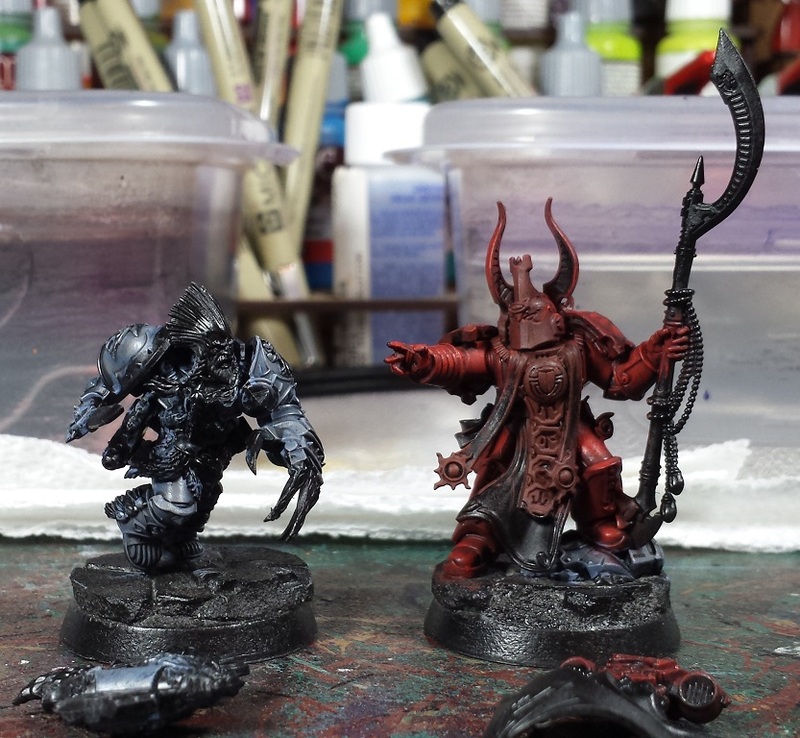 In other news, I naturally got my hands on a couple of the Prospero box sets, and started laying in the first few colors on Ahriman and Geigor Fellhand. Gotta keep one foot in the Heresy after all! They all look great! I'm eager to see how weathering goes, as it's a technique I've only just begun to experiment wth myself, so I'm keen to see how other people do it! Lovely work Mordian, the ice blue lights are really bright Xeon bulbs for the mining works. Look great already, weathering will be awesome. Nice shades on Ahmirain too. Looking great. I really like the blue tarps. Shivers. Mine hasn't arrived yet ! I think I might take the lights up a bit more toward white. That would get them pretty close to those migraine-inducing halogens that most newer cars seem to have. I love it! The rock grinder is fantastic. Really want to get a couple as just 30k terrain. @myincubliss: Thanks! I'm a total noob at it m'self, we'll see how it goes! @Matthew Davies: Awesome! Really looking forward to seeing what you come up with! @Siph_Horridus: I appreciate it - been a fun project so far! @WestRider: That's a good call, they could stand to be a bit more bright! @Col. Hertford: Thanks! It is a great kit, and I'm glad to see some quasi-civilian stuff start to make an appearance! Looking really well on the grinders there chief, I think some heavy weathering will really make them pop. I love those Goliaths! The weathering and danger stripes on the dozer blades is awesome. @Rory Priest: Thanks man! Going to be busting out the sponges and stipple brushes soon! @#2501: Cheers bud! The painting charts are just a simple excel worksheet. Drop me a line at moonlight(at)cold-moon.com and I'll shoot you a copy of what I use! O mate, those vehicles look great! The blue really works well as both a contrast from the yellow and the metallics add some tasty depth. Bravo.